Be the first to share your favorite memory, photo or story of Richard "Richie". This memorial page is dedicated for family, friends and future generations to celebrate the life of their loved one. 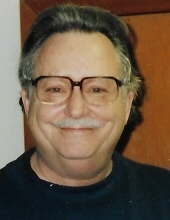 Richard “Richie” Byrd McGill, 75, of Oak Ridge passed away Thursday, April 11, 2019 at NHC Health Care Center. He was born July 4, 1943 in Louisville, KY, one of six children born to Thomas Marion McGill and Reva Byrd McGill. Mr. McGill was a 1961 graduate of Oak Ridge High School. After high school he served with the US Army National Guard. He was an avid golfer and worked for several years at South Hills Golf Course. In his earlier years, he sang with several area bands. He enjoyed memberships at the Amvets, Moose and Elk Lodges. Richie was a people-oriented individual and loved his friends and family. He is survived by brother, George McGill of Kingston and sisters, Katherine Simmons, Marian Smith (Sherrill), Betty Ford and Nancy Stephenson, all of Oak Ridge. The family will have a private celebration of his life. Memorials can be made to the American Heart Association. Weatherford Mortuary is handling the arrangements. An online guest book can be signed at www.weatherfordmortuary.com. To send flowers or a remembrance gift to the family of Richard "Richie" Byrd McGill, please visit our Tribute Store. "Email Address" would like to share the life celebration of Richard "Richie" Byrd McGill. Click on the "link" to go to share a favorite memory or leave a condolence message for the family.